People on the fringe. That’s what you might call them. People on the fringe of respectable society. Sometimes beyond the fringe. These are not the good, upstanding people who have their act all together and are living their best life now. No, these are people with problems in their life. People who have gotten off track and maybe now are regretting the bad choices they have made. Perhaps they’re looking for a better way, but they don’t know where to find it. People on the fringe. And guess what? Jesus specialized in dealing with people on the fringe. He hung around with them. He was not ashamed to get to know them. He was a friend to such people. And he showed them where to find the help they needed. Our text is the Holy Gospel for today, the story of Jesus and the Canaanite woman. She, the Canaanite woman, is a good example of someone on the fringe. She’s an outsider, and she has problems. But she comes to Jesus, and Jesus helps her. Although, at first, it looks like maybe he won’t help. But Jesus knows what he is doing. More on that later. First, though, let’s back up for a moment. Our text opens by saying, “Jesus went away from there and withdrew to the district of Tyre and Sidon.” Now where is the “there’ from which Jesus went away? That would be the region of Galilee, where Jesus made his base of operations. Why did he leave there? Well, things were heating up. The opposition Jesus was getting from the scribes and the Pharisees was getting more intense. So Jesus decided it was time to withdraw for a while, to get away for a while. His hour had not yet come. There was more for him to do before things got to the point of him getting arrested and killed. He had some things he wanted to teach his disciples more privately, for example. So Jesus takes the crew and heads out west, far away from Galilee. 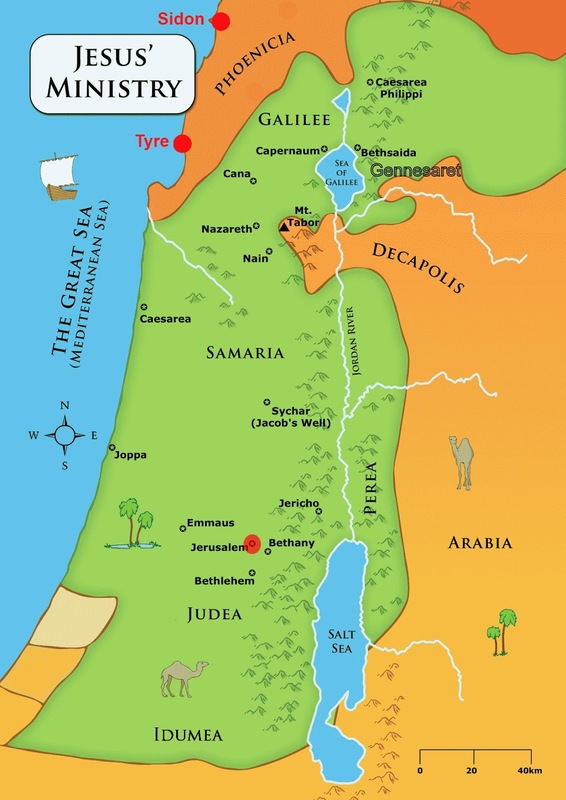 “Jesus went away from there and withdrew to the district of Tyre and Sidon.” That’s all the way to the Mediterranean coast, in the far northwest corner of Israel, near the border of Phoenicia to the north, which is modern-day Lebanon. “And behold, a Canaanite woman from that region came out,” it says, and she approached Jesus. Let me try to give you an analogy. It would be kind of like if Jesus wanted to get away from here for a while, so he flew out to Seattle, in the far northwest part of the country, and here comes a woman from Vancouver, British Columbia, up in Canada, just across the border. Now it says that this was a “Canaanite” woman. That’s an interesting choice of terms that Matthew uses. In Mark’s gospel, this woman is called a “Syrophoenician” woman, which was the more contemporary term at the time of the New Testament. But Matthew calls her a “Canaanite” woman, which was the more historic, Old Testament term for her ethnicity. To call her a “Canaanite” brings with it a lot of baggage. The Canaanites were an ancient enemy of the Israelites, the people that the Israelites were to drive out of the Promised Land 1400 years earlier. The Canaanites were a pagan people, worshiping false gods of their own making. So that’s what Matthew is accenting when he calls her a “Canaanite” woman. Now how would a Canaanite woman, from that pagan culture, know to call Jesus the Messiah? Well, this gets to the point about people on the fringe. Even though they’re on the fringe of the church, and not in it, because of their proximity to the church, they do come into contact with it, and that may give them an avenue to faith. This woman, living on the border with Israel, apparently had heard about Israel’s messianic expectations and how Jesus was fulfilling those prophecies. She had heard enough about Jesus that she knew to come to him for help. So what’s going on here with Jesus? Here’s a woman who needs help. He’s very good at giving this kind of help. And yet he doesn’t immediately respond with said help. Seems out of character for Jesus. But the point Jesus is making here is that, yes, in his earthly ministry for those few years in Israel, he did come primarily for the Jews, to minister to them directly and specifically. This was as it should be. He was fulfilling his mission as the Messiah of Israel. Of course there would be more, much more, but this was not yet the time for that. The mission to the Gentiles would come, but not yet. First, to the lost sheep of the house of Israel. But again, the woman is not deterred. “Yes, Lord, yet even the dogs eat the crumbs that fall from their masters’ table.” Ah, she’s catching Jesus in his words! And he likes for that to happen. She acknowledges his mission to Israel, but at the same time she says that maybe there’ll be some leftovers, some scraps off the table, for the likes of a Gentile like her. Bravo! Jesus applauds her for her faith: “O woman, great is your faith! Be it done for you as you desire.” And her daughter is healed from that hour. You see, by putting her off for a little bit, Jesus is doing two things. One, he is giving her an opportunity to exercise her God-given faith and persistence. And secondly, Jesus is sending a message to his disciples. Yes, Jesus must first fulfill his mission to the lost sheep of the house of Israel. But then, after that, his mission will indeed extend to people outside of Israel. There will be a mission to the Gentiles, and Christ’s disciples, his apostles, need to know that. It won’t just be Jews that will need to hear the gospel. It’s like we heard in the Old Testament lesson from Isaiah. There will be “foreigners who join themselves to the Lord.” And again: “The Lord God, who gathers the outcasts of Israel, declares, ‘I will gather yet others to him besides those already gathered.” In other words, God is going to gather people on the fringe–and even beyond the fringe. You see, God’s mercy is big enough for all. For we are all sinners, Jews and Gentiles alike. Israelites, Canaanites; insiders, outsiders; good people, bad people; church people, and people who haven’t set foot in church in years. We are all sinners in need of God’s mercy and forgiveness. Which is why Jesus came in the first place. To be the Savior of all people. And that’s what he accomplished when he, the very Son of God, shed his blood on the cross, suspended between heaven and earth. Jesus was making peace, peace with God, dying in the place of all sinners, you and me included. Respectable ones and people on the fringe, we all have been disobedient toward God, but God has had mercy on us all. Forgiveness, peace, life, eternal salvation–this is the free gift of God in Christ Jesus for all who call upon his name. If that is so–and it is–then Christ’s church, our church, likewise is to be a home and a welcoming center for all, including those people on the fringe. There are people in our community who might fit that billing of “people on the fringe.” They have gotten off track in their life. They have made bad choices in life. They may not have darkened the door of a church in a long time. But . . . but they know you. And you know them. Or at least you come into contact with them and have the opportunity to reach out to them and get to know them. Who are they, these people you meet and come into contact with? They are people with needs. They are people who are hurting–although they may not always show it. They are divorced or separated. They are depressed. They are parents with children who are autistic or suffering from various diseases. These are people on the fringe. And we, we who ourselves have found help and hope and healing in Christ–we are set among our neighbors to bring them light, to bring them God’s love and mercy, to bring them Jesus. So let’s be on the lookout for those hurting people and how we can be a channel of God’s blessing to them. Those people on the fringe. Who knows? God may just use us to give them the same mercy and comfort that we ourselves have received. God grant it for Jesus’ sake. Amen. Excellent insights. I remember C.S. Lewis writing that it was the “nasty” people, those who know their sinful hearts and failings, who understand their inability to join the respectable and outwardly better people of society…..who love The Lord the most, with no presumption of their own righteousness…..these are the ones to whom Jesus has the greatest appeal. For me, the lesson is to never forget to be genuinely humble and appreciative of our loving God, lest I become legalistic, puffed up, or start to feel my religious profession makes me more worthy than the “nasty” ones who, like the publican, only feel true grief and cry out for mercy….which God in His grace provides most abundantly. Great insight and very informative! Great information about this part of Jesus’ ministry! Naturally synergize trail-blazing God moments.